With so much of modern media rapidly and pointlessly switching between target locations, it’s important to remember just how much drama we can extract from a single spot..
My guests this week are Len Falkenstein (UNB Director of Drama), Temi Osunbunmi (actor), Mary Walker (actor) and Julianne Richard (actor). 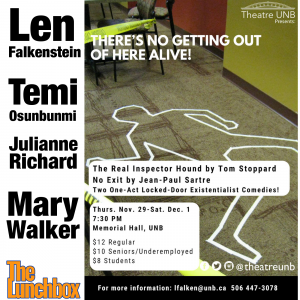 This week, Theatre UNB brings not one but two plays, a double-feature of one-act, locked room mystery plays, overall entitled There’s No Getting Out Of Here Alive!. 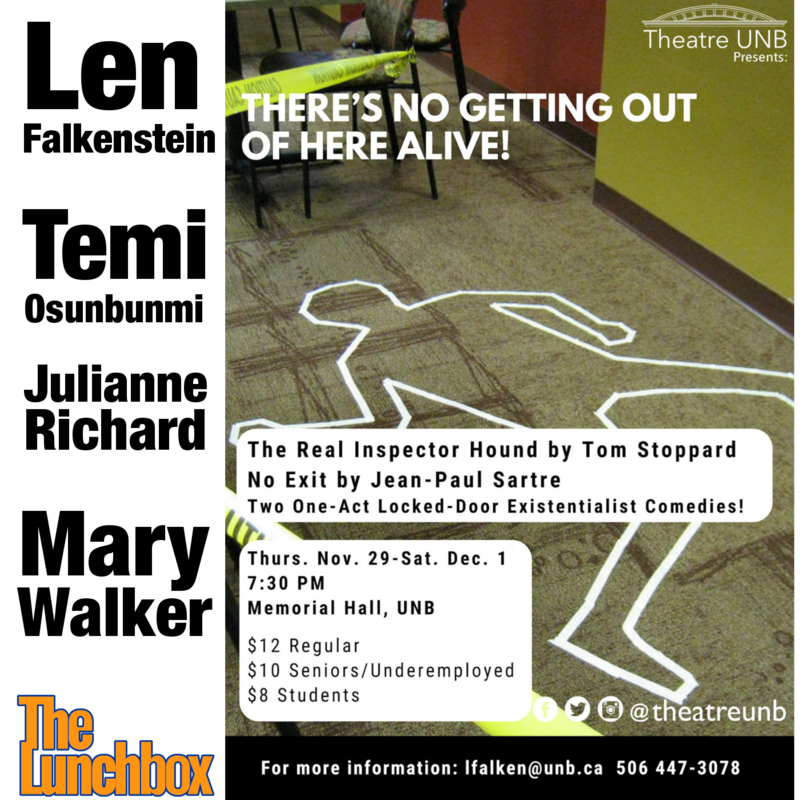 The evening presents Jean-Paul Sartre’s No Exit and Tom Stoppard’s The Real Inspector Hound. The group joins me to talk about the challenges and benefits of single-location, one-act plays, as well as what sort of dark or ridiculous humour we can expect to see. There’s No Getting Out Of Here Alive! opens on Thursday, November 29 at 7:30pm at Memorial Hall on UNB campus, and runs Friday and Saturday nights as well. Don’t miss it!